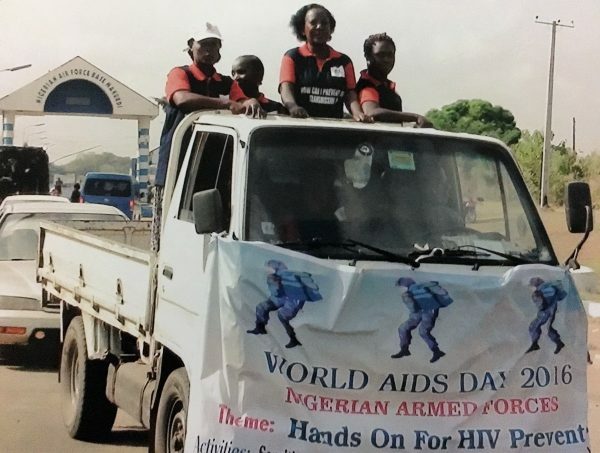 The 2016 World AIDS Day in U.S.DOD Walter Reed Program-Nigeria was celebrated in two-fold: Interagency/Embassy level and the USDOD/NMOD Program sites. On site level, 11 USDOD/NMOD Program sites participated in this year’s World AIDS Day (WAD) which targeted the barrack community and its environs. This year’s theme titled, “Hands on for Prevention” aimed at creating sufficient awareness within the barracks and its community to guard against HIV/AIDS infection and advocated on the need for all to get tested and know their HIV status. It also, emphasized the fact that prevention was better than cure and so the need to intensify preventive measures to produce an HIV free generation. This was the mantra across the selected sites participating in this year’s WAD. The Program’s Prevention team collaborating with the Barrack Health Committee conducted free HIV Testing Services (HTS), rallies, condom distribution and use promotion, interpersonal communication sessions and HIV focused group discussions, all with the objective of enlightening Nigerians and meeting the 90-90-90 UNAIDS/PEPFAR goal. 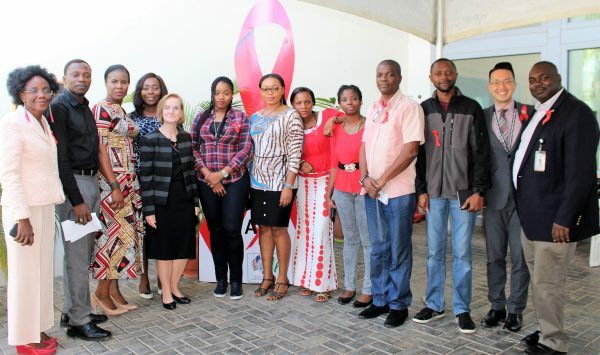 Within the Embassy, all U.S. government agencies of CDC, DOD and USAID in an interagency collaboration with the U.S. Embassy organized series of activities to mark the World AIDS Day. Beginning with a blood drive led by the Nigerian Blood Transfusion Service, WAD continued with several Embassy staff getting tested in order to know their HIV status. Other activities included HIV/Health talk and a call-in radio HIV education program. The PEPFAR Coordinator, Shirley Dady in her opening remarks, encouraged Nigerians to get tested, and know their status as this was crucial in stopping the spread of HIV/AIDS and in providing care and treatment to infected individuals. The U.S. Ambassador, Stuart Symington, making his debut public appearance concluded the event when he recanted that Nigerians were in control of what happens to them.